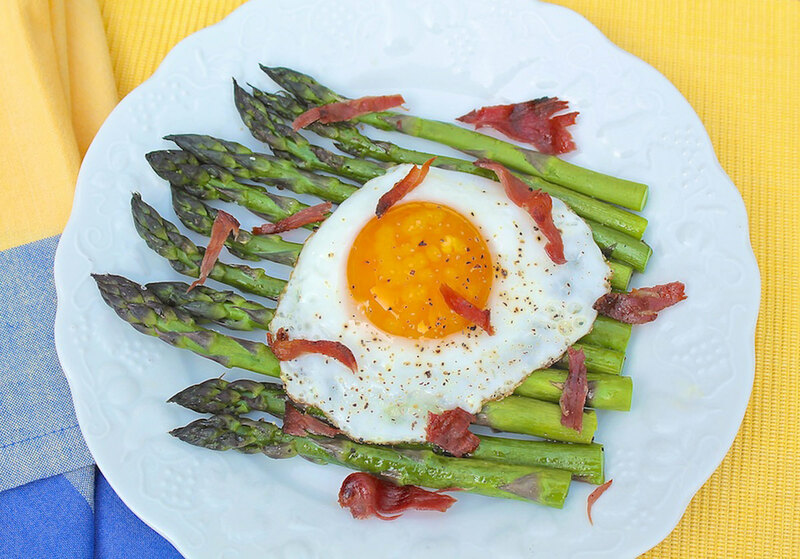 Years ago, I marveled at the description of a meal with two basic ingredients: eggs and asparagus. The simple combination was described as very “French country.” I envisioned ambling up to a quaint market in picturesque Provence and buying a large bunch of freshly cut asparagus. From there, I strolled a short distance to another vendor and purchased freshly laid eggs. The image was so simple yet so glamorous. A basic reality snapped me out of my reverie: I can do that here! Fertile farmland and bountiful farmer’s markets surround Lancaster County. As the days lengthen and plant life erupts once more from the rich soil, there’s hardly a vegetable more anticipated than asparagus. That these tender shoots can be transformed into a meal both glorious and rustic is no small reward after waiting so long for their return. 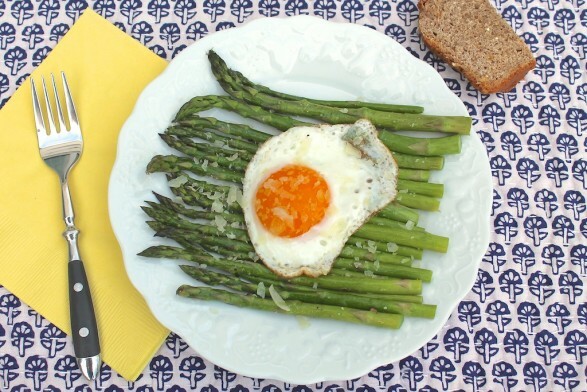 The egg sits on top like a cheerful ray of sunshine, providing protein and a natural sauce for the asparagus. Normally, I like my eggs over-easy, but when the yolks are so vibrantly orange, I hate to flip them. In this case, I simply place a lid on the skillet for a few minutes. That way, the egg is sunny side up without being too runny. A light crumbling of crisped prosciutto adds texture and a hint of saltiness. It makes the meal seem a bit more substantial, too. Bacon may certainly be used instead, or omit the meat entirely for one less step and a nourishing vegetarian option. For a kid-friendly approach, consider the spears as finger food and dip them directly into the yolk. (This is one of those things I tell my kids that they can do at home but not at a restaurant or a friend’s house!) A side of toast or a crusty roll is equally perfect for dipping and rounds out the meal nicely. For a wholesome homemade option, you may enjoy Brown Soda Bread with Steel Cut Oats. It’s a no-yeast, no-knead bread with a hint of nuttiness to it. 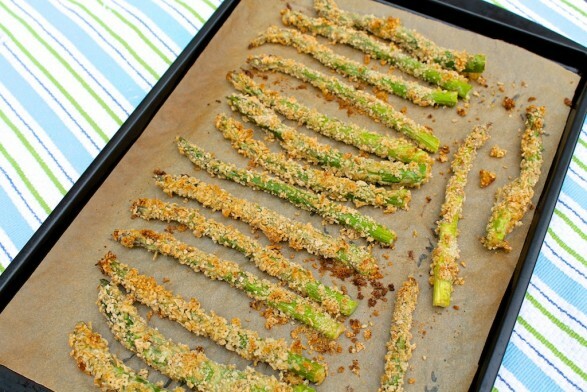 Increase the oven temperature to 400 degrees F. Toss the asparagus with a small amount of olive oil. (I use a mister and coat with just enough oil for the salt and pepper to stick.) Sprinkle with salt and pepper to taste, and then bake at 400 degrees F for about 8-10 minutes, depending on the thickness of the spears. Skinny spears will take less time. I like asparagus to be cooked al dente and test by sticking the point of a sharp knife into the thick end of the spear. Meanwhile, cook the eggs to your liking in a skillet coated with olive oil or melted butter. (Poached eggs are a delightful option, too. If you don’t enjoy a runny yolk, go ahead and make scrambled eggs.) Sprinkle eggs with salt and pepper to taste. 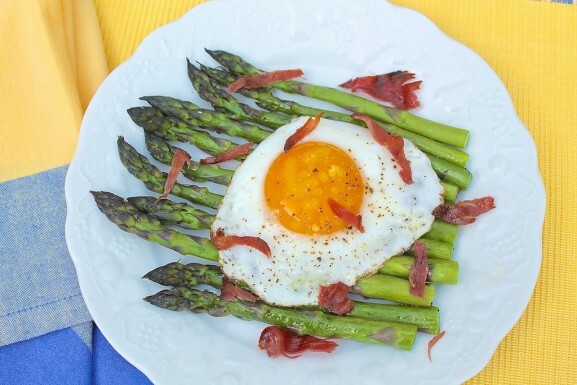 Serve the eggs over the asparagus, and then scatter the crumbled prosciutto over top. For a delicious vegetarian option, simply omit the prosciutto and add a fresh grating of Parmesan cheese, if desired. 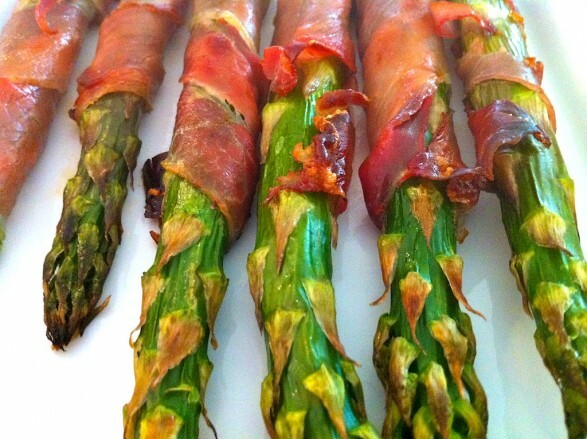 Prosciutto-Wrapped Asparagus — 2-ingredient perfection! so happy that the asparagus is coming in! 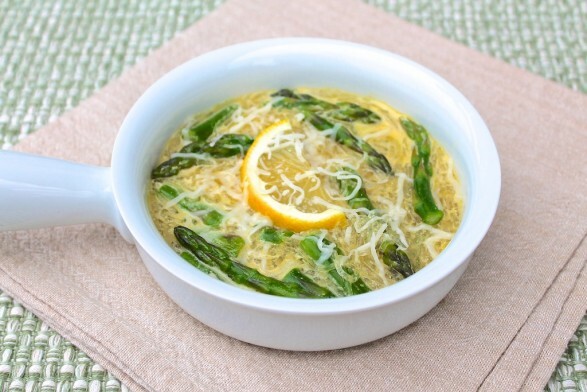 We do a similar dish at our house – a tangle of spaghetti, spears of roasted asparagus, a dippy egg, lots of freshly grated Parmesan and black pepper. Maybe a drizzle of olive oil. Might have to add proscuitto next time! I love your “tangle of spaghetti,” etc. It sounds divine, Margo!